Need to buy new tires in Raleigh? Call the tire professionals at TransMedics at (919) 954-8699 — the premier auto shop serving clients from all over the Triangle. 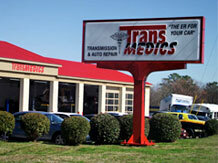 For more than a decade, TransMedics has been a leader in the automotive services arena, providing the service and support that only a family-owned and operated company can. We will do what we can to earn your business — we want you to get new tires from us! Lower gas mileage – Are you noticing your car, truck or SUV just isn’t getting the gas mileage it once was? Do you take your car in for regular oil changes and tune-ups and still can’t find a reason? There are a few likely culprits, but one major factor could be tires. Worn tires place additional stress on the engine, which in turn equates to more fuel consumed. Your tread fails the “Penny Test” – The penny is the smallest monetary unit in the U.S., and it’s also the cheapest, easiest way to see if you need new tires. Insert the penny upside down (Lincoln’s head facing down) in the tread grooves of your tires. If you can see “Honest Abe’s” entire head, you probably need new tires. If the very top of his head and hair are covered, your tread is probably in good shape, and you can likely postpone buying new tires. Your tires are over six years old – It’s simple: Tires should be replaced at least once every six years, depending on usage. It’s irrelevant whether or not you’re an aggressive driver, or that the mileage on the tires is low. Over time, the rubber begins to degrade, regardless of usage. Don’t put it off any longer — get new tires from us! Visit our auto shop on Old Wake Forest Road in North Raleigh today to browse our first-rate selection. We offer all the leading brands, including Michelin®, Goodyear® and more!